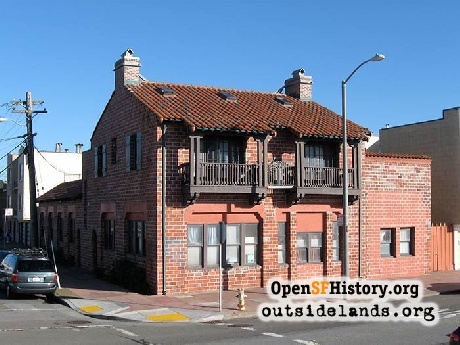 The history of two distinctive Great Highway buildings, both residences that were once restaurants. At a street fair a couple of weeks ago I met an old-timer who knew I was interested in history. Perhaps inspired by Halloween, he told me that when he was a kid in the 1940s everyone said that 2600 Great Highway was haunted by a “vicious ghost.” I’m often told of or asked about haunted houses, and while I don’t believe in the supernatural I do enjoy a good ghost story all the same. 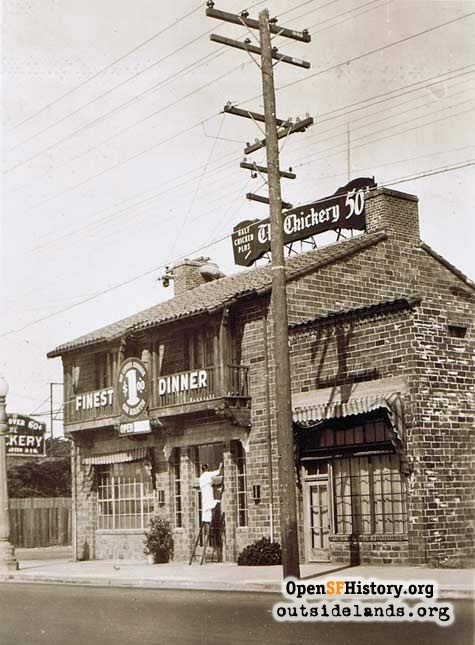 I am often asked about 2600 Great Highway (also known as 3655 Vicente Street), and a building to the south of it, on the corner of the one-block Cutler Avenue. The two corner buildings bookend the block face on the Great Highway. The Vicente corner building is an odd mix of Mission-style elements—clay tile roof, rough-hewn wood balconies—and a red brick facade with dual chimneys. The building at 2650 Great Highway (also known as 50 Cutler Avenue) has an impressive bank of second-floor windows and a long balcony facing the ocean. Art Deco appliqué decorates the exterior over windows on the ground floor and on the Cutler Avenue side. While rented as apartments today, both buildings seem interesting enough to be structures with stories behind them, ghosts or not. I’ve heard that one of the buildings was used as a speakeasy and brothel during Prohibition. Ocean Beach was definitely a place for one or both of these business models in the early twentieth century. Police frequently conducted vice raids on the old roadhouses and “cafés” at the beach to find the places where alcohol was served illegally, and to round up underage and unaccompanied women. But the problem with this story is that the two buildings were constructed in 1927, seven years into the dry era. Could someone have had the brazenness to erect an elegant building right on the Great Highway with the intent to use it for illegal activities? Perhaps, but it seems inordinately expensive and conspicuous to me. Each building was designed by an architect and cost more than $10,000 to construct. 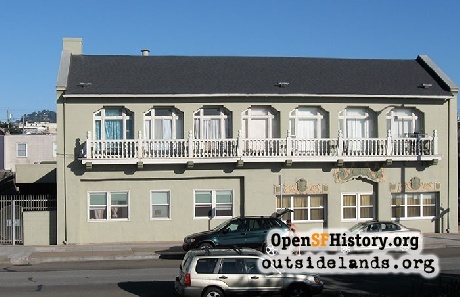 Another tale that has been passed along is that an heir to the Schilling spice company built one of the buildings as an oceanside retreat. 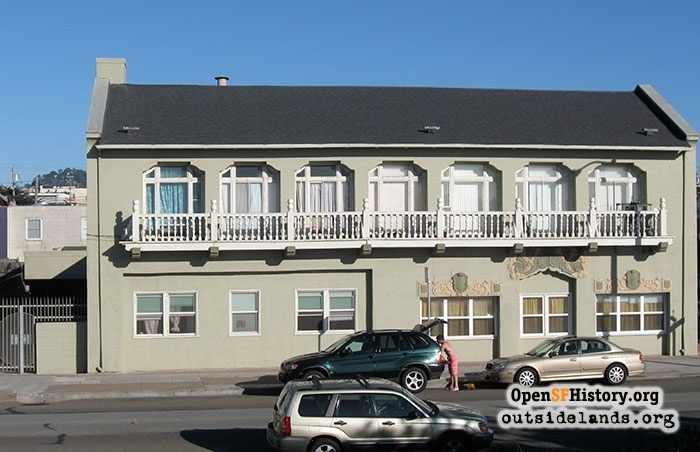 While this isn’t the case for these buildings, a number of people did have second homes at Ocean Beach over the years. One of the more attractive is 1984 Great Highway, now occupied by a church. At the turn of the twentieth century, San Francisco fire chief Dennis Sullivan used this wide-eaved cottage as a getaway. Sullivan was tragically injured during the first moments of the 1906 earthquake when part of the official chief’s residence on Bush Street collapsed and Sullivan fell three stories, fracturing his skull. Sullivan was in a coma and died after three days, and the Fire Department was without its leader to coordinate the fight against fires that destroyed most of the city. If the chief had spent the night of April 15 at the beach, perhaps more of old San Francisco could have been saved. Returning to our humbler buildings around Vicente Street, clues to their origin can be found by knowing what the area was like in 1927. Ocean Beach had always been a recreational destination for San Franciscans, but with the rise of the personal automobile, really large crowds began arriving in the 1910s and 1920s. The San Francisco Examiner reported a count of 15,468 automobiles visiting Ocean Beach on just one Sunday, December 9, 1917. People parked on the Great Highway to enjoy the waves and sea air, but also to be entertained. New and wildly successful attractions opened up for the masses. The small amusements north of Golden Gate Park—a carousel, carnival rides and games of chance—were bought up and expanded upon by the Whitney Brothers, to become Playland-at-the-Beach. The premier attraction of Playland, the Big Dipper wooden roller coaster, opened in 1922. At the other end of Ocean Beach, San Francisco Recreation and Parks, led by commissioner Herbert Fleishhacker, opened a six-million-gallon outdoor swimming pool—complete with lifeguards in rowboats—on the marshy dunes south of Sloat Boulevard. Sutro Baths next to the Cliff House still brought in swimmers or those interested in viewing the pavilion curiosities of stuffed sea lions and Egyptian mummies. Large roadhouses and restaurants such as Topsy’s, Mendel’s, Shorty Robert’s and Tait’s had bands and fine dining. Many smaller places, from waffle shops to burger stands, fought to serve customers interested in more casual food. Both 2600 and 2650 Great Highway fell into this last category, opening as small restaurants. Although I still haven’t found a business name attached to the Cutler corner building, a man with the romantic name of Ulysses Ciati shows up in directories running a restaurant at the address. 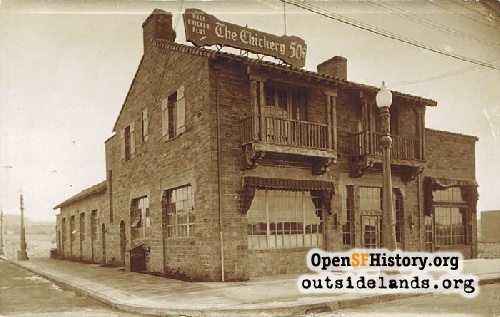 The red brick building on the corner of Vicente and Great Highway was a family-oriented place called the Chick-ery, offering 50-cent chicken dinners. Neither business seems to have gotten far into the Depression of the 1930s. Perhaps a Schilling did live in one of these buildings afterward, and I won’t say those second-floor rooms didn’t see their share of hanky-panky in the past, but if there is a ghost at 2600 Great Highway it’s likely one of the hundreds of birds made into a chicken dinner. Page launched 14 May 2015.